What are mildew and mold? How do I get rid of mildew and mold? What can I do to prevent mildew and mold? What can I use to clean my tile and grout? Why is my grout cracking and crumbling? Why are my tiles coming loose? Can you replace a cracked tile? Can the tiles in my Victorian House be saved? Why not use acrylic to restore showers and baths? Why does Grout Rx use Microban® products? Molds are fungi. Common fungi include mushrooms, puffballs, truffles, yeasts, and most mildews. Mildews are actually types of mold that manifest as whitish powdery growth on plants. Molds begin as microscopic airborne spores that germinate on contact with the surface of nonliving organic matter where moisture is present. Mold is then able to penetrate the organic matter where it secretes enzymes, absorbs water, and digests sugars and starches from the nutrient source. Unsealed, or sealant that has worn off of tile grout used in bathrooms is an ideal environment for molds to thrive. Getting rid of mildew and mold in grout and caulk with topical treatments is difficult if not impossible in that all too often it has grown beneath the surface of what we are trying to clean. While bathroom cleaners and home remedies are billed as being adequate solutions, they cannot penetrate deep enough to eliminate the problem. All too often, harsh chemical treatments employ acids and bases that deteriorate the molecular structure of the grout, making it even more porous and susceptible to fungal growth. In instances where mold has begun to grow, the grout and caulk must be removed and the affected area should be treated with a fungicide to eliminate any microscopic traces of mildew or mold. Then, re-grouting and sealing the new grout will help make it water resistant. However, over time, water will slowly start to penetrate the sealed grout allowing mildews and molds to grow again. To help prevent a new build-up of molds and mildew, we at GroutRx use products with built-in Microban® anti-microbial technology. Using Microban® grout and sealant in conjunction with each other goes a long way in preventing mold. Once you are rid of mildew and mold, the best preventative measures you can take to guard against their return are maintaining a dry environment and re-sealing grout every few years. It is critical that you maintain a dry environment in order to fully prevent mildew and mold. Whenever a shower or tile surface gets wet, it should be fully dried. Window washer squeegees are often used to pull water down off of shower walls and then a towel can be used to sponge up any remaining water off of the bottom of the floor, or you can simply dry the whole shower with an old towel. It should take about a minute and keeps the surface free of soap scum as well as mildew and mold. Use a plastic stiff-bristle brush and a pH-neutral cleaning solution. The best cleaners for tile and grout are pH-neutral cleaning solutions, such as Simple Green Stone Cleaner or 'Grout and Tile pH-Neutral Cleaner' available at Morris Tile Distributors who have several locations in Virginia. Don't use acid-based cleaners that "clean" by removing desirable material. Applying acids to clean your tile surface may destroy certain ceramic glazes and weaken grout by leaving it more porous. Porous grout is more susceptible to trapping stains and dirt deep within the cell structure, making it difficult, if not impossible to clean. Grout is not waterproof and will absorb water as the shower is used. Sealing the surface will help prevent water from penetrating the tile installation, thereby help prevent mildew, and will make grout easier to clean. Sealing should be done both when a tile surface is new and every few years thereafter. Sealing grout does not prevent grout from getting dirty, so it is recommended that a regular cleaning schedule be followed. There are many products that claim to change the color of grout by staining it. This is really a misnomer in that the products do not stain or penetrate the grout. Staining products are topical paints that wear or chip away over a short period time often leaving the grout looking worse than it did before the staining. The best way to change the color of grout is to remove the old grout and re-grout the tile surface. Often, people will choose a darker colored grout in high traffic areas that will not show dirt. The subfloor plywood attached to joists that are spaced greater than 16" on center. There any cracked, rotted, or termite damaged joists. The subfloor was not properly attached to the joists thereby causing movement between the subfloor and the joists themselves? The proper thinset was not used for the situation. Thinset coverage was not satisfactory due to an incorrect notch trowel size or insufficient prep of tile (they should be wiped clean of any dust prior to installation). Expansion joints were not incorporated into the substrate with proper seam tape installation. Dimensionally unstable or questionable materials present to which the tile was bonded. Why is only my grout cracking and crumbling? Grout is a Portland cement and must be mixed properly in order to adhere well and form a strong filler for tile joints. When mixing this particular cement with water, a proper consistency must be achieved. Improperly mixed grout can lead to weak grout lines that crumble and crack. Grout can also crack along seams of walls where expansion and contraction occurs. This is common in shower installations. It is critical to caulk such areas to prevent water from penetrating behind a tile surface. The solution to such problems is to remove the pre-existing grout and apply new grout and caulk. Why are my tiles coming loose or cracking? Tiles that become loose were not installed correctly. In some instances, contractors will cut corners and apply tile directly to plywood baseboard or drywall which will cause the tile to come loose and crack away from the grout. In a rush to remodel, some homeowners opt to tile over pre-existing floor surfaces. Tile must be applied to a concrete surface or a synthetic underlayment designed for tile installation in order to adhere properly. If tile is being applied to anything other than a concrete foundation, concrete backer board must first be installed. Backer board is a fiberglass board infused with concrete that is sold in 3 x 5 foot sheets usually ¼ to ½ inch thick. There are two common brands: HardieBacker or Hardi Board and Durock or Dura Rock. Concrete backer board should be screwed into a substrate with rust-resistant screws designed specifically for this application. If nails are used they allow the board to more easily yield to the stress of shifting substrate, leading to problems with the tiles. When tile is being installed, a type of concrete called thin-set mortar is used. If thin-set is improperly applied and the full surface of the under tile does not completely come in contact with the mortar, the tile can sound hollow, crack, and often times come loose. These tiles can be re-adhered with varying degrees of success dependent upon the underlying surface. Tile can also crack under the stress of settling concrete surfaces. In many historic homes tiles were set too closely to one another, and as the walls settled, the tiles pushed against each other causing them to crack. Cracked tiles can be removed and replaced. However matching the surrounding tile can sometimes be troublesome. In an instance where an exact match cannot be made, picking a color to contrast the original tile often reinvents the room and avoids the haphazard look of tiles of a slightly different color. See our Before and After Photos for some examples. Can the tiles in my Old House be saved? If the tiles themselves are not cracked or damaged, they can be re-grouted and sealed, essentially restoring them and preserving the historic character of your home. If cracked tiles cannot be matched, it may be possible to pick contrasting tile for an attractive new look. See our Before and After Photos for some examples. Sometimes tiles in historic homes (Colonial, Victorian, Craftsman, Mid-century Modern) suffer from cracks due to the shifting of walls. In instances where the homeowner of a historic house would like to completely re-tile the walls of a bathroom, they are often faced with the costly renovation of gutting concrete mortar walls or tiling over the pre-existing tile. With a newly perfected process, seen here in our YouTube video, we can remove the existing wall tile while preserving the concrete substructure for retiling. This process cuts down on the time and cost of unnecessary demolition. Acrylic liners generally just cover-up a problem - they are not a real solution. Moisture can become trapped between the walls and liner. This is especially common when acrylic is used to cover showers and baths that already show signs of deeper moisture damage such as mildew. Once the liner is applied, water can no longer evaporate, providing the ideal environment for molds and mildew to continue growing. If there was previous water damage beyond the tile substrate, it can continue to rot causing structural problems. Acrylic liners cost the same or more than a full bathroom remodel. They are exorbitantly expensive compared to re-grouting and caulking existing tiles. Re-grouting can be done in the same period of time as acrylic. 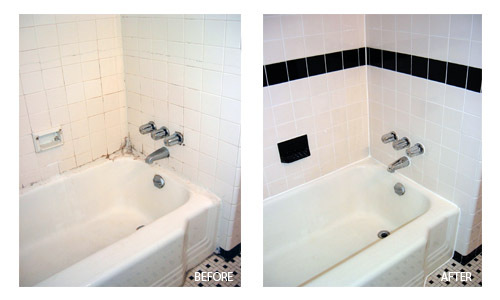 Re-grouting is a more cost-effective and long-lasting approach to renovating tiled bathrooms, kitchens, and floors. Call GroutRx Richmond, VA (804) 864-0661 for your free estimate today! Grout Rx uses Microban® products to help prevent the build up of molds and bacteria. When mixing grout, we use Laticrete® admix with Microban® instead of water. The caulk products we use also contain Microban®. Microban®'s antimicrobial technology is built-in during the manufacturing process and becomes an intrinsic part of the product inside and at the surface. Microban® gives products an added level of protection against damaging microbes such as bacteria, yeasts, mold and mildew that can cause stains, odors and product deterioration. When microbes come in contact with the product surface, Microban® protection penetrates the cell wall of the microorganism and disrupts cell functions making the microorganism unable to function, grow and reproduce. Microban® technology is not designed to protect users from disease causing microorganisms, so it is recommended that the usual cleaning schedule be followed. Microban®'s long-term protection continuously fights the growth of microbes that can cause stains, odors and grout degradation. Microban® protection makes the grouted tiles in your home easier to clean and keeps them cleaner and fresher between cleanings. For more information on Microban® protection which helps prevent the growth of odor and stain causing bacteria, mold, and mildew on grout and caulk, go to their web site. A variety of flexible products (latex, acrylic, water-based) applied to seams of dissimilar materials and expansion joints where grout has the potential to crack. A mortar used to fill the joints between tiles. Grout reinforces the tile installation and helps prevent moisture from penetrating the joints. It also plays a part in the overall design aesthetic. The width and color of the grout joints can radically alter the look of a tile installation. A mixture of plain grout and sand. Used in larger joints, and also widely used in flooring. Like thin set mortar, it is a mixture of Portland cement and additives used in joints 1/16 of an inch or less. Also effective in showers and walls. Composite of resin and hardeners used when chemical and stain resistance are required or high temperatures. A concrete based adhesive that bonds the bottom of tiles to the floor. A blend of Portland cement, sand, and additives mixed with water. Similar to water-mixed mortar, yet has latex or acrylic additives for improved adhesion to tile. Mixture of liquid resins and hardeners, effective when substrate is not compatible with other adhesives. Stronger than regular thin set mortar when applied in heavy layers. Often used when tiles do not have uniform backs. Concrete and cements, including Portland cement, are binders that harden to bind different materials together: such as tiles onto walls. For more detailed information and a historical background, see Wikipedia on Portland Cement. Grout Rx is locally owned and operated and has been in business for over ten years, with many more years experience in building renovations. It was founded by David Morrison. We service residential and commercial clients throughout the greater Richmond, Virginia area. Grout Rx is bonded and insured and continually works to maintain a high level of customer satisfaction. Our service areas include Henrico, Goochland, Hanover, New Kent, Midlothian, and Powhatan Counties. We also serve the Middle Peninsula around Deltaville, Virginia.